[Spoiler alert!] After last week's episode — which could almost be summed up as an hour of the Doctor shouting, "STORIES ARE THE MOST POWERFUL AND IMPORTANT THING IN THE UNIVERSE" — Doctor Who returned this week with a reminder of the kind of story the show thinks it's important to tell: a story about war overcome by peace, anger overcome by dialogue, and fear of the Other overcome by respect. The setting was about as dangerous and potentially explosive as you can get: a Soviet submarine during the height of the Cold War, loaded with nuclear weapons and itchy trigger fingers. Into that volatile mix, writer Mark Gatiss (the same guy who co-created Sherlock with Steven Moffat, wrote a few other episodes of Doctor Who and played the role of Dr. Lazarus) throws not just the Doctor and Clara, but also an Ice Warrior — a race of scary, militaristic reptiles from Mars. Suddenly, it's not just the Russians and the Americans who might spark a nuclear holocaust, but the Martians too. Ice Warriors in a Cold War. But there's more to them than a convenient pun. 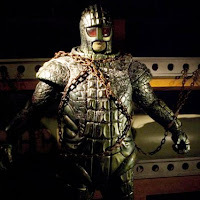 Ice Warriors have a lonnnnnnng history on Doctor Who stretching all the way back to the '60s. They were originally portrayed as clunky villains, attempting to conquer the Earth in order to escape the destruction of climate change on Mars. Since then, though, they've been used to explore themes of aggression and non-violence. In one 1970s episode, the warrior race renounced violence altogether. Not Grand Marshall Skaldak, though. 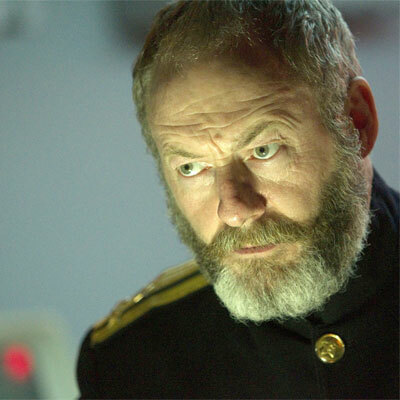 The Ice Warrior on the submarine (tip: never thaw out a mysterious block of prehistoric ice when you're trapped in a confined space) clearly has no problem with violence: in his rush to escape at the beginning of the episode, he kills a few anonymous Russians and damages the ship so badly that it's put out of commission on the ocean floor. Before long, he gets even scarier and more threatening than that. 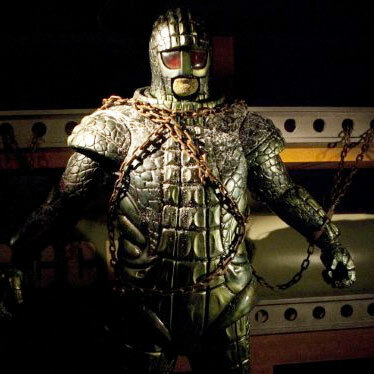 Doctor Who fans used to complain the old Ice Warriors were too slow to be scary, so Gatiss throws in a new twist: that clunky armour is just a suit, and when Skaldak leaves it behind, he's super-fast and apparently quite limber, able to climb the walls and strike out of nowhere. Like so many of Doctor Who's aliens, Skaldak makes for a pretty scary Other. Especially given the setting. Fear of the Other was, of course, one of the driving forces behind the Cold War — propaganda and paranoia had the Communists and Capitalists seeing each other as a vague, inhuman evil. And submarine films, from Das Boot to The Hunt for Red October, have always been a particularly powerful way to portray that kind of fear: all alone in the dark while your enemy is out there somewhere, unseen. Skaldak takes that fear up a notch. I mean, you can't get much more Other-y than an actual real live alien. And he's not lurking in the shadows outside the ship, but in the shadows inside it, bringing death from above in the form of a menacing reptilian claw. In most sci-fi "base under siege" stories, that's where the alien's character development would end. He'd be a scary monster to be defeated. But Doctor Who isn't interested in just portraying the fear of the Other, the show wants to expose it as the irrational and dangerous impulse that it is. So Gatiss gives us enough information to see Skaldak as an individual with his own backstory and motivations. He has been trapped in the ice for thousands of years; he's alone and mourning for his family ("Five thousands years," he laments. "Now my daughter will be dust. Only dust.") and for the rest of the Ice Warriors, who he assumes have all died too. ("My people are dead... There is nothing left for me except my revenge.") It's not hard to understand how scared and angry Skaldak must be. He's not just a faceless Other, he's a person. His violence doesn't spring from some kind of incomprehensible Ice Warrior blood-lust, but from the motivations of a fully-formed character. As a result, we can understand even the most horrifying things he does. Twice the Russians call Skaldak "a monster" and twice the Doctor corrects them. It's the Captain who first uses the term, at the end of the Martian's rampage through the ship — the Doctor tells him that no, Skaldak is a solider and "deserves our respect." Then, when Clara, the Doctor and the pop-music-loving Professor find the corpses Skaldak has dismembered, it's the Professor who says it: "He's a monster. A savage." But the Doctor quickly corrects him: "No Professor, not savage, forensic." Skaldak dissected the bodies to learn about his enemy. He's not a senseless killer, he's a rational one. And you can always hope to reason with rational beings. For most of the episode, the Doctor is trying to get face to face with the Ice Warrior so he can negotiate with him. "Jaw, jaw not war, war," the Doctor says, paraphrasing Churchill. And for his part, Skaldak is willing to at least listen every time they do meet. But the Ice Warrior isn't the only threat on board. There are all those humans, too. We learn right at the beginning of the episode that there's something of a power struggle being waged between a trigger-happy Lieutenant (played by that guy who plays that guy on Game of Thrones) and the somewhat more peaceful Captain (played by that other guy who plays that other guy on Game of Thrones). Not only does the Lieutenant seem anxious to get the nuclear holocaust with the Americans underway — "The Cold War won't stay cold forever," he says — he's also pretty much the worst person to have around during delicate negotiations with an alien warrior. Sure, the Martian seems willing to listen, but when the aggressive Lieutenant attacks him with a cattle prod, the cycle of violence starts all over again. The human, it seems, is at least as much a villain as the alien is. From there, the violence quickly escalates — as it tends to do. Before long, it seems as if the literal sparks of that cattle prod may be the metaphorical spark that finally ignites global nuclear war. Skaldak has his finger hovering ever-closer to the red button, ready to launch the submarine's nuclear missiles — and more Ice Warriors are on the way to save him, likely to destroy our planet in the process. In the end, just like last week, the Doctor turns to the power of stories to help save the world. As Skaldak's finger inches toward the button, the Doctor tries to convince him to show mercy — essentially by asking him what he wants his story to be. "Is this how you want history to remember you?" he asks. "Grand Marshall Skaldak, destroyer of Earth? Because that's what you'll be if you send those missiles. Not a solider, a murderer." Humans, according to the Doctor, are "still just frightened children, still primitive... Teach them, Grand Marshall. Show them there is honour in mercy." It buys them some time, but Skaldak grunts dismissively and turns back to the button. At that point even the Doctor gives up on peaceful dialogue and starts threatening violence. He'll blow up the submarine before Skaldak reaches the button. Mutually Assured Destruction. Thankfully, while the Doctor might have lost faith in the value of words, Clara hasn't. She steps in with an appeal to the Ice Warrior's compassion. "The Doctor's right," she tells him, "billions will die. Mothers, sons, fathers, daughters. Remember that last battle, Skaldak, your daughter..."
And that, it seems, is the key. Humans have daughters, too. They're not just some faceless Other. At that very moment, the Ice Warrior ship arrives. Skaldak is teleported to safety, but the Martian Code dictates the Earth should still be destroyed — "You attacked me," Skaldak explained earlier, "Martian law decries the people of this planet are forfeit." Instead, he shows mercy. The Ice Warriors disarm the submarine's missiles and they leave in peace. The scary alien Other who started off the episode as the villain turns out to be something of a hero in the end. So does Clara. For the second week in a row, she's the one who ultimately saves the day, not the Doctor. This week, she did it by doing what the Doctor's companions always do at their best: remain committed to peace when even the Doctor seems ready to abandon it. They remind him of the good in humanity. She was also a reminder of the terrible reality of conflict. While the threat in last week's episode was a bit ephemeral and abstract — having your soul sucked away by a star — this week provided a blunt reminder of the physical horror of violence. 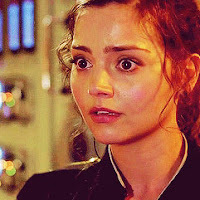 At the beginning of the episode, Clara seems to be treating the whole thing a little too lightly, almost like a game. ("This wasn't a test, Clara," the Doctor reminds her at one point.) But that levity disappears quickly. She's clearly shaken after seeing those dismembered bodies. "It's all got very real," she admits to the Professor. In war, people suffer, loose their families and their lives, have their bodies torn apart. And with nuclear weapons, the whole world is at risk. Those are the stark realities of what's at stake when we talk about violence — and the truth behind the importance of storytelling that Doctor Who has been exploring for years. Like Skaldak, we make our decisions based on the way we see ourselves. And so, the stories we collectively tell ourselves — about whether we want to be warriors or peacemakers — decide whether people live or die. They can cause suffering or put a stop to it. At the end of the episode, the Ice Warriors might have gone home, but the Earth is still very much in danger. The Cold War is still going. And though, in the end, humanity overcame that conflict, we're still at risk today. In 1983, the year of this week's episode, the Doomsday Clock was at 11:56. Today, it's at 11:55. Of course, we don't need Doctor Who to tell us the world is a dangerous place. We're all too aware of that fact, especially this week, as we all mourn for the people lost and injured in Boston. But it's at times like these — a week which also sees North Korea threatening nuclear war, a man trying to poison the President of the United States, the American Senate refusing to enforce basic background checks on new gun owners, Boston police harassing a bombing victim for being Saudi, and our own Canadian Prime Minister denouncing the Opposition for wanting to uncover the root causes of that bombing — that the stories of Doctor Who are particularly important. They remind us to be peacemakers, always peacemakers — even in the face of fear, even in the face of horror, even in the face of death. - Some people online are wondering if the Ice Warriors will show up again soon. And given their history with Martian climate change, I wonder if that might be another theme that gets explored this season. The carnivorous snow of the Great Intelligence has plenty of climate change potential, too. - The Professor gets Clara to sing Duran Duran's "Hungry Like A Wolf" when she's scared. A coincidence? Or yet another nod to Rose Tyler? A Bad Wolf reference? It's enough to make you wonder: that and the Crown & Rose pub where the Victorian version of Clara worked, and the fact that Clara's mum died on the same day the mannequins rampaged through London during Rose Tyler's first adventure with the Doctor. - The second week in a row in which music plays a role. - The show has been going back to super-old aliens recently. The Great Intelligence hadn't appeared on the show in 44 years. Now it's the Ice Warriors, who hadn't appeared on the show in 39 years. Both were a big deal all the way back in Doctor Who's fifth season, which was also big on "base under siege" stories. - "History's in flux," the Doctor says, as he so often does, "It can be changed, rewritten." This seems to me like more than just explaining the nuts and bolts of time travel to a new companion. It's an over-arching theme that bears repeating. We're constantly in process of writing history, all of us, always — even the history that has already happened, in the way to remember it and chose to tells its stories. - This episode reminds me that Doctor Who began in the golden age of science fiction — during the Cold War, when nuclear holocaust was a frequent theme. And I'm reminded of much more I like these kinds of Cold War-inspired stories than the Red Scare Invasion of the Body Snatchers kind. Next Doctor Who recap: Doctor Who & The Splinter of Ice. Previous Doctor Who recap: Doctor Who & The Power of Stories.